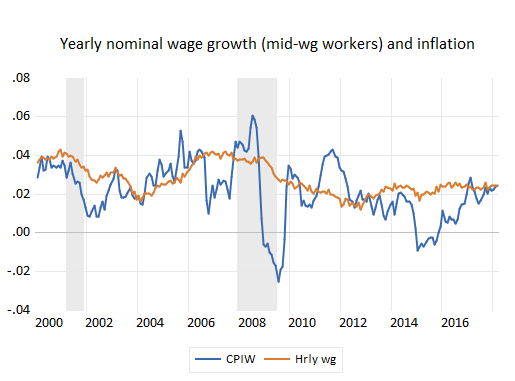 Real wages for mid-wage workers actually haven’t grown much over the past couple of years. We always talk a lot about wage growth on jobs day because, you know, it’s jobs day. But later in the month, when the inflation numbers for the previous month are released, we should really say something about real, as in inflation-adjusted, wage growth. After all, what matters most to people is the buying power of their paychecks, right? But their claims should not be taken seriously. First, these are jumpy, monthly numbers, so you want to look at the longer-term trend, and second, the bit about prices falling is particularly weird. Deflation is clearly not upon the land—that’s a monthly blip. The figure below plots the real, hourly wages for middle-wage workers: the 82% of the workforce that are production workers in factories and non-managers in services. Since around 2016, real wages have actually pretty stagnant. It’s bad economics to measure trends over presidential terms, but given the CEA’s tweet, note that since December 2016, the real hourly wages of middle-wage workers are up only 0.2%. These folks are working more hours per week, so their real weekly earnings did a tiny bit better, up 0.5%, but the technical term for that is bupkes. You’re probably wondering what caused that unusual real-wage jump in the last recession. Real wage movements tend to be pretty smooth relative to price changes, which can be volatile when there’s a shock to some commodity, often energy. In fact, energy costs tanked in 2008, and that led to a sharp decline in the price index (note: I’m mimicking BLS and using the CPI-W to deflate this wage series; not quite sure why they use this rather than the regular CPI but it doesn’t affect the results). The next figure plots nominal wage and price growth, year-over-year, showing how that big uptick during the downturn was driven by a large, negative price spike. 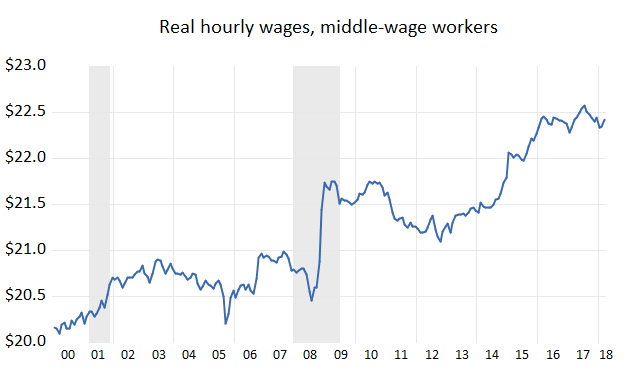 This figure also reveals something that many of us have grown concerned about: even as we close in on full employment, we’re not seeing much acceleration in nominal (and, as Figure 1 showed, real) hourly wage growth over the past couple of years. I think there are three reasons for this. In order of importance: there’s still slack in the job market, productivity growth is slow, and inflation is low (faster price growth tends to correlate with faster nominal wage growth). Real white-collar hourly pay* is up 1.4% since Trump took over (versus 0.2% for mid-wage workers; 1.7% real gains for white-collar weekly earnings, vs. 0.5% for mid-wage), so some of what’s going on here may be the unequal distribution of earnings. I should also caution that the Establishment Survey data I’m using are one among many different wage series. Some, like the BLS weekly earnings series by wage percentile, show strong growth among lower paid workers, a point wage analyst Elise Gould has convincingly tied to places that raise their minimum wages. But, as far as middle-wage workers are concerned, most series show roughly similar dynamics to the figure above. So, not a lot to crow about re the trend in real earnings for most workers. They’re pretty much tracking inflation at this point, which is a recipe for wage stagnation, not pats-on-the-back. Share the post "Real wages for mid-wage workers actually haven’t grown much over the past couple of years." 5 comments in reply to "Real wages for mid-wage workers actually haven’t grown much over the past couple of years." puzzling over slow wage growth. The regular factors, productivity, globalization, automation, are their top culprits, in the 40%-75% rating range. They do list “Employer Concentration” and it gets about a 25% rating. From their perspective, from above, it’s probably well under valued. Then again, a bit surprising it’s even on their radar. I’ll be interested to see your assessment of employment monopoly as it’s better studied. Wage growth is not slow in the service sector. Looks like to me, inflation should be more around 0%. Post-war inflation back in the 50’s and 60’s was very low and provided for solid real gains until the late 60’s when things fell apart. This may be a dumb question, but how does inflation affect wages? We like to measure the actual increase in buying power of your wage. If your wage goes up 2% but the price of everything went up 2%, it’s as if you got no raise at all. 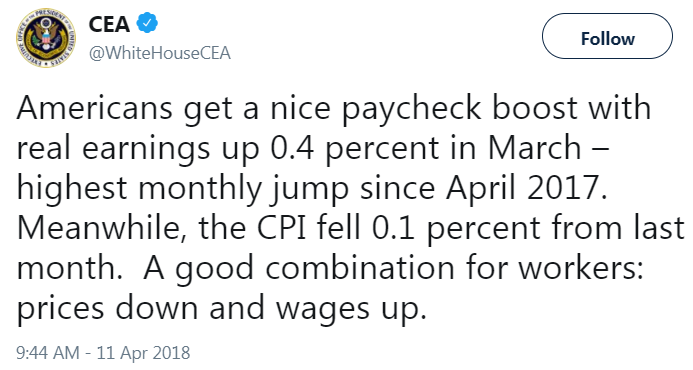 Two years ago when fracking oil and gas hit the market, and oil dropped in half, inflation dropped to near zero, and it made real wage increases jump. But no one actually got a bigger raise or higher salary. It was just from lower inflation.